Jared and I recently attended a baseball game with a ’70s theme so we went to Goodwill to find suitable clothing. We ended up with some really groovy vintage outfits and were reminded that itchy, heavy, vintage polyester does not mix well with heat and humidity. Regardless, we had a fun time (or as much fun as a non-sports fan like myself can have at a sporting event). More importantly, though, while at Goodwill I found two fantastic vintage dresses. This one is really…special. It was half off and set me back $2.69. 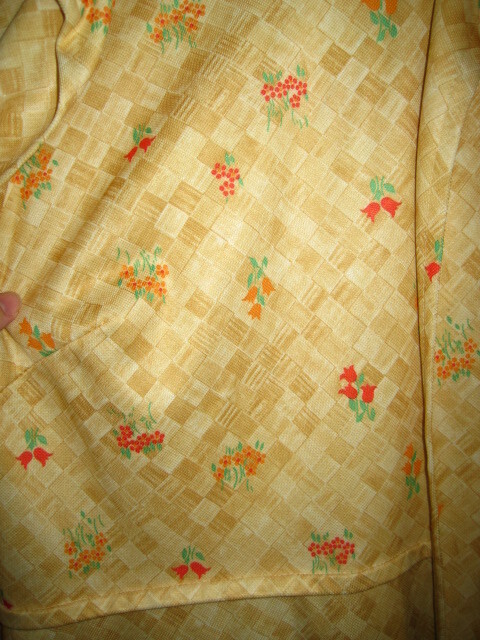 It is a stretchy polyester knit with an allover yellowish-brown basket-weave pattern. The bodice, shown in part above, has flowers in green and two shades of orange, while the skirt has just the basket-weave design. The dress is ankle-length and comes with a matching, long-sleeved jacket. It is seriously ugly and a couple of sizes too big, but there is something charming about the pattern that reminds me of a 1970s kitchen or something. I may shorten this and take in the sides a bit to make it wearable. 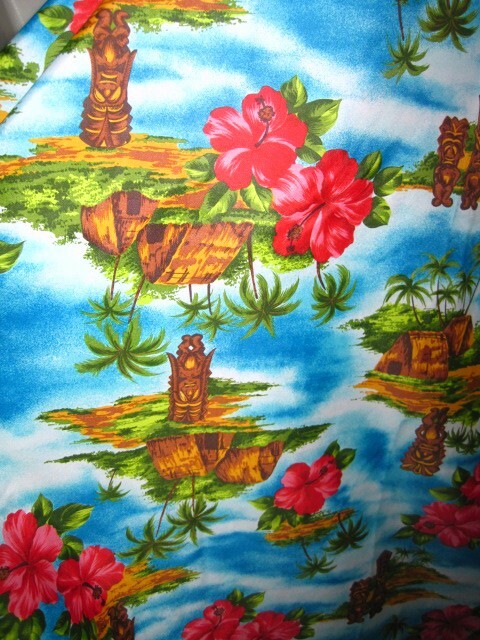 This is part of a fabulous Hawaiian print dress in a thin polyester (or some similar material–I am bad at fabrics). It, too, is ankle-length and has a halter top. The skirt fits but the halter top is way too small–a wardrobe malfunction waiting to happen. I think there might be enough fabric here to make a short sundress if I find a suitable pattern. I am a little wary of cutting up such a fabulous dress, though, so there is a chance that it might just sit in my closet for years. This one cost a little over $5.00, I think. Before I think about these, though, I am hoping to make a wrap dress to wear to an upcoming wedding. This will be my first project with my serger. More details to come, I hope. I rarely go to garage sales, mainly because I simply don’t think of it but also because I rarely find anything worthwhile. Some people have an almost magical ability to find the most wonderful things at garage sales and thrift stores, but I am not one of those people. Today, however, I was with my parents (my dad, especially, is a pro garage-saler) and stopped at one. I walked away with a couple of good finds, including a small box of assorted ribbon priced at ten cents. While the quality and condition varies, I will definitely be able to use at least some of this. I also got another box of sewing notions for a quarter. It is a pretty odd collection of stuff, including coverable buttons, fasteners, and lots of belt buckles, but I was most interested in the tailor tacker, which should be useful for both patternmaking and garment construction. Again, I don’t know whether I will use most of this, but at twenty-five cents who could resist? I also bought six yards of ivory satin for three dollars. I really don’t know what I’m going to do with all that satin, but I’m sure inspiration will strike eventually. Finally, I wanted to show off the new dish towels I got today, courtesy of my dad’s amazing auction skills. This is one of a full set of seven towels hand-embroidered with birds doing household chores. Here they appear to be cleaning their birdhouse. I love the cute design and the vivid colors, but I have no idea what to do with these. I’m afraid they might get dirty if I use them for their intended purpose, but I can’t think of anything else and I don’t want to just keep them in a box or cupboard. I’d love to use the embroidered portions as clothing appliqués somehow, but I don’t know if that’s possible or whether I’m willing to cut them up. For now I will just admire these absolutely charming designs. I feel inspired to take up embroidery again.